Don’t panic, but we’ve been surrounded. Travel around Santa Rosa (and to a lesser extent, Sebastopol) for ten minutes and it’s likely you’ll encounter one or more buildings designed by “Cal” Caulkins, Santa Rosa’s top architect roughly between 1935-1960. Outside of the neighborhoods built by Hugh Codding, no other person did more to define the look of Santa Rosa than Caulkins. He was also prolific. By going through the Press Democrat archives he can be found named as the architect on over 100 different buildings, and that’s not counting projects that were dropped or reassigned, projects that were simply remodels and, of course, projects that weren’t mentioned in the paper. I found references to 17 Santa Rosa houses and believe the true number is 2-3x more – either that, or there was an army of contractors here during the late 1930s doing Caulkins knockoffs. The residential buildings he created are not artsy or pretentious – but neither are they boring and repetitious like the Codding houses. But most of his work was not in designing houses; he did about twice as many civic or commercial buildings (including a roller skating rink), a couple of dozen schools and a handful of churches. His masterpiece is probably the Art Deco-style goliath on Fourth street which is now home to Barnes & Noble (more about that later) but everything he designed has merits. A chronological list of all his known work can be found at the end of this article. ENGLISH-NORMAN Hybrid style popular in the 1920s-1930s and also called Tudor-French Norman style. Stucco walls with half-timbering often more curvy and elaborate than simple Tudor; casement windows; cross-gabled with a steep hipped roof and the entryway beneath its own gable or part of a tower. STREAMLINE MODERNE/PWA MODERNE Simplified version of Art Deco often intended to mimic 1930s automobile styling; curved edges, glass bricks, casement window pairs on corners, aluminum or even chrome trim. PWA (Public Works Administration) Moderne was another offshoot of Art Deco popular for public buildings in the 1930s-1940s. MID-CENTURY MODERN Single story with maximum window space making walls as transparent as possible; flat roof, sharp angles, multiple exterior entrances preferred to hallways; often intended to look prefab or modular. Also before we begin, full disclosure: I have a personal dislike (strike that: indifference) for much of his architecture, but my bias is not against his work specifically – I just don’t have a taste for any form of modernist architecture, which had its heyday during the same decades as Caulkins’ career. To me the “moderne” styles are Art Deco without the art, often making me think of bus stations (Caulkins did remodel the Greyhound station here) or Los Angeles’ oppressive downtown civic buildings (my long-running joke has been the style should be renamed, “Sepulveda”). The many elementary schools he designed in the mid-century modern style probably looked outdated by the time the first kindergarten students graduated high school. At the same time, Caulkins did his best with what the clients of his era demanded. Those schools that appear mired in the ugly 1950s had an innovative baffle roof (invented by Caulkins) to bring in natural light to the side of the classroom farthest away from the big windows. Each of his residences in historic revival styles had its own unique touch in some significant way – unlike the cookie-cutter Codding houses. And while his cottage-type homes were designed for families with middle class budgets, they don’t look cheaply made. Another difference from much of what Codding built. So. Standing from the Google viewpoint, the building closest to the camera is the 1940 Thurlow Professional Building. On the distance on the other side of Tenth street is seen the 1938 Hamlin Medical Building. Note the large overall area of wall space devoted to windows on both, as well as corner windows wherever possible. The SEIU building at 600 B street shows more of a debt to Art Deco, mainly because of the door and torch lights on either side (although I don’t know if these were original). Ribbons in the concrete steps lead to the entryway with its aluminum canopy, which is repeated on the side. The entrance is in the middle of the building, yet the window layout is asymmetrical. Walk across the blocked intersection island (uh, why is it there?) to 576 B street. The imposing pilasters give it that heavy PWA Moderne look, although the corrugated metal cladding adds much needed color. Note the caduceus medallion at the top from its old days as a medical building – which is a bit awkward as the offices have been used by lawyers and accountants for as long as I can remember. Proceed up Tenth street to see the side of the building, again packed with metal frame windows, including every corner. The arrangement of the windows is asymmetrical although edges line up vertically. Continue up Tenth and turn left at the stop sign, walking to the intersection of College and Mendocino avenues. Cross College ave. at the stoplight and proceed left (west) on College. Turn right (north) at the first street on Glenn, and then two short blocks to Benton street. There are at least five Caulkins homes in this general neighborhood – and likely more we don’t know about – making it Ground Zero for his residential work. One reason there may be so many is because he lived at 100 Ridgway avenue (now cut off on the other side of the freeway) during the 1930s and early 1940s. The 1937 Douglas house at the corner of Glenn and Benton streets is a fine example of how adept Caulkins was at tinkering with the popular styles of his day. While all that half timbering and the steep roof screams jolly olde England, one doesn’t notice the other stuff that’s completely discordant. The many dormer windows are extremely large for the house – but since he used shed roofs instead of the usual Tudor gables, they don’t draw much attention. (I’d also argue that without the distracting half timber the house would look top heavy.) And look: Metal frame casement windows on three corners, à la Streamline Moderne. Turn east on Denton Way, walking on the right side of the street. You will pass two more Caulkins houses at #432 and #446, built respectively in 1935 and 1936. Aside from mentions in the Press Democrat, we can ID these as Caulkins houses because of…wait for it…corner window pairs. (The windows at #446 are updated.) The newer house also has a unusual feature also found on the Chamber of Commerce model home he designed about the same time: A tall, swept standing seam canopy draping over a bay window. At the end of Denton Way is the 1937 house for Acme Beer baron Floyd Trombetta. It is the largest of the Caulkins homes in the area and the one most conforming to a style, here Spanish Colonial Revival – no Streamline Moderne windows this time. He did somewhat break stride by putting the entryway in a tower, per the English-Norman hybrid. Proceed north on Mendocino avenue. You’ll immediately be in front of St Luke’s, which Caulkins designed in 1945. It is supposed to be “Tudor English Gothic,” but aside from some of the fenestration I wouldn’t have guessed. Walk north to the stoplight at Ridgway ave. where you should cross Mendocino ave. to the east side. Continue two short blocks to the Crawford Court intersection. On the corner is the home Caulkins designed in 1936 for his friends, the Trombleys. “Professor” George Trombley was Santa Rosa’s premier music teacher and founder of the Santa Rosa Symphony in 1929. Although it’s now altered and broken up into apartments, this was a showplace when it was built; the Press Democrat printed his drawing at least twice, along with a lengthy description of how “ultra modern” it was. And yes, there were corner windows. Cross the street back to the west side using the pedestrian stoplight and continue north until you reach the Santa Rosa Junior College gate. This was designed by Caulkins and dedicated June 15, 1935 in a ceremony including the widow of Luther Burbank. Here would be built a grand college, the arch promised. In the years that followed, Cal Caulkins designed ALL of the original buildings on the campus. If he had created no other architecture in his life, he should be remembered for that. His full name was Clarence Adelbert Caulkins Jr., although everyone called him “Cal” – which has caused some to mistakenly assume he was a Calvin. He was born 1899 in Montana and studied architecture at UC/Berkeley, where he worked for years with John Galen Howard, who designed the Empire Building and would have given Santa Rosa several other memorable buildings had our civic leaders not gone on the cheap. Caulkins moved to Santa Rosa around 1932 and partnered with William Herbert, an architect who had been here for about fifteen years. Curiously, the prolific Caulkins is now all but forgotten while Herbert’s prestige as “Santa Rosa’s first architect” has risen – even though he accomplished little. Today Bill Herbert is falsely credited with projects such as the original Luther Burbank school (sorry, it was built about ten years before Herbert showed up) and the designs which appeared during the firm’s sudden burst of activity that began once Caulkins joined the firm. Herbert is often named as the architect for Sebastopol’s 1935 Park Side School, for example, although the design is clearly in synch with Caulkin’s version of PWA Moderne. What Herbert did accomplish was mainly in the 1920s, particularly as being the supervising architect during the construction of Santa Rosa High School. He was also Santa Rosa’s building inspector for a number of years. Only two surviving examples of his solo architecture still can be found in Santa Rosa – a modest house at 418 Denton Way and the “Von Tillow Block” at 616 Mendocino ave., home to the Round Robin dive bar. Although William Herbert was said to be an MIT graduate, I’ll wager it was in a field of study other than architecture. Scan the list below of the work produced by the Herbert & Caulkins office in 1935 and be humbled – two major schools, the first Junior College building (the gym), a major office building and four houses in Santa Rosa, one of them a place in Proctor Heights that the Press Democrat called “palatial.” There were probably more; next door to the house at 1121 St. Helena ave. is another from the same year, both exactly using Caulkins’ English-Norman vocabulary. And a couple of doors away is #1107, which was used as a model home for a time, eventually becoming the Caulkins family home. And on top of all that, he did a design for the county hospital (seen here). When Caulkins opened his own office in 1936, things got really busy for him. 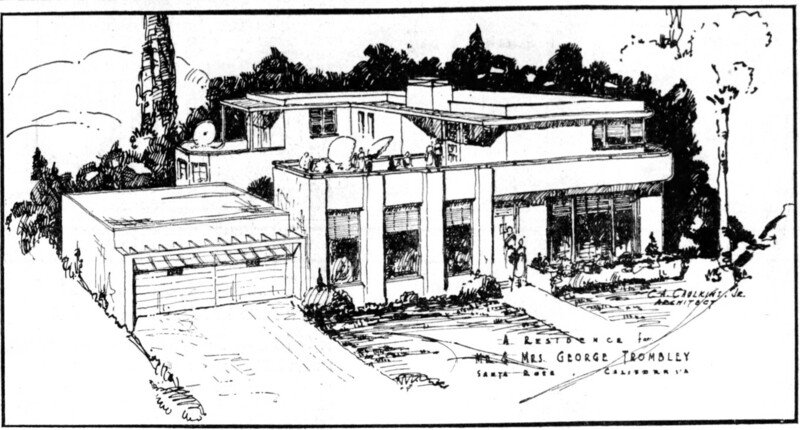 There were at least seven more houses including the Streamline Moderne showpiece for his friends, the Trombleys. And then the disaster of May 8th happened. 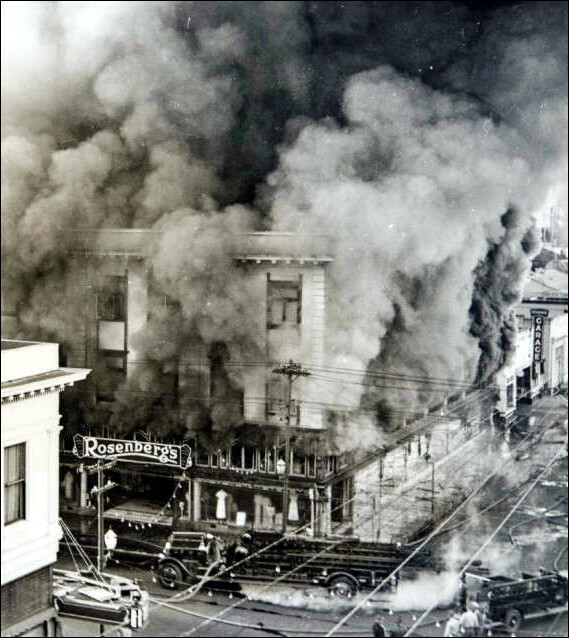 The fire at Rosenberg’s Department Store was most devastating event in Santa Rosa since the Great 1906 Earthquake. The fire was so fierce there was concern that the city reservoir might not have enough water to fight it. Firemen from all over the area needed several tense hours to bring it under control. The Rosenbergs vowed immediately to rebuild – and as the lost building’s upper floors were a major hotel, there were two businesses to restore. They gave Cal Caulkins the commissions for both. The site at Fourth and B (currently the CitiBank building) was to become the New Hotel Santa Rosa as soon as fire debris was cleared and the blueprints were ready. The department store would be built on the half-block at Fourth and D, which was then a gas station and a garage. The Rosenbergs already owned the portion of Third and D which is still used as a parking lot behind the store. The New Hotel Santa Rosa opened in December 1936, just seven months after the fire which is nothing short of amazing – three shifts of construction workers were kept busy 24 hours a day. The exterior of the hotel appears plain and rote, but that’s only because all photos are in black and white; when it opened the PD spent a paragraph praising Caulkins’ innovative use of color – yet without describing what the colors were. Inside the design straddled Moderne and Art Deco. Aluminum bands were used there as well to create strong horizontal lines with indirect lighting cast upward from the pillars. These features continued in the dining room, which could seat 350 (!) and had walls painted in brown, yellow and apricot, which might well have been the muted exterior colors as well. 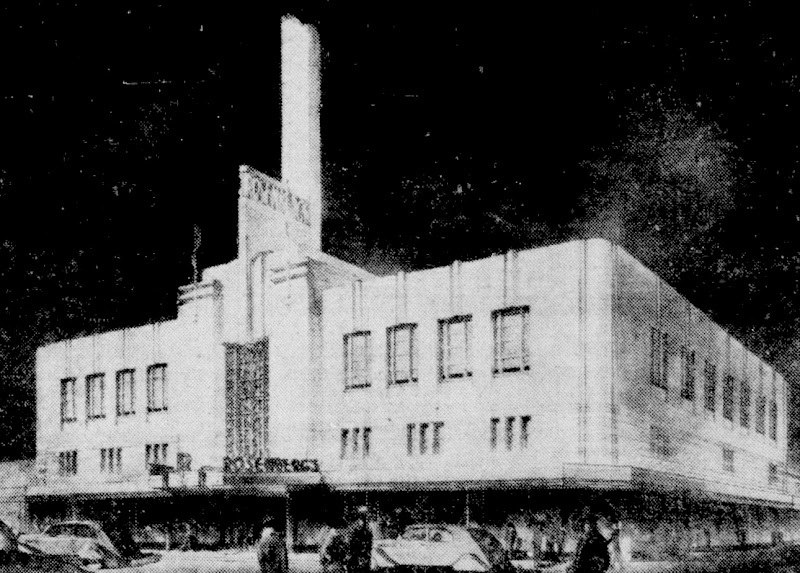 But also in December the paper revealed the San Francisco firm of Hertzka & Knowles were the architects for the department store. Nothing was said of why they were replacing Caulkins – or if he was being replaced completely. The second drawing below appeared just before construction began and was most likely done by H&K. The most striking difference between Caulkins’ early drawing is the tower, which reached the building’s six-story potential – as the tallest structure in town, it was said to be like a beacon when illuminated at night. Aside from that, his preliminary sketch of a much larger building is recognizable in this later drawing, particularly the strong vertical decorative elements on the face contrasting with a stack of belt courses wrapping all the way around. And there’s plenty of that glass brick which Caulkins was intending to use. Whether H&K completely took over or collaborated with Caulkins is unknown, as is whether the final design belongs to him, them, or both. I’m inclined to believe all of the store’s interior and most of its exterior should be attributed to Caulkins; as seems to be the case with the hotel, there’s an originality in the design which defies simple definitions of what Art Deco or Streamline Moderne is “supposed” to look like. Nor can I find any examples of Hertzka & Knowles designing anything else that looks like this store. In 1941 they created the Leader Department Store in Petaluma (later Carithers) and that’s best described as being more in the International style, so devoid it is of any artistic features. What does seem clear is that the poor guy was overstretched when construction plans were being finalized at the end of 1936. Besides the two enormous Rosenberg projects and the houses, a major problem arose at the Junior College while constructing his second building, causing all work to stop (the lumber was poor quality). With pressure to open the hotel doors ASAP, Caulkins would have had to be superhuman to give the department store project his full attention, what with the required budget breakouts, contractor bids, and million other last minute details large and small. Construction on the store began in January 1937 and its grand opening was shortly before Hallowe’en the same year. Caulkins stayed incredibly busy over the next few years – check out the timeline below. In 1938 alone he designed Burbank auditorium and three other major buildings at the Junior College. He also became president of the Rotary, which seems to have been a full-time job, judging be all the doings reported in the news. And when WWII happened he went away for three years as a civilian employee designing dorms and housing for the Navy, becoming the architect for the entire Naval District in the Bay Area. And now the obl. Believe-it-or-Not! surprise twist: Everything you’ve read here so far about Caulkins is just prelude to the really interesting story. When Cal came back from the war, he had a vision to redesign almost all of Santa Rosa’s downtown core from the ground up. Instead of the grid of streets which had been platted out way back in 1853 when there was only a couple of houses, a tavern and stray pigs, Caulkins envisioned a magnificent modern civic center to serve the town and county, something which likely would have turned us into a model city of postwar reconstruction for the entire United States. The Chamber of Commerce loved the idea, as did the labor unions, service clubs, veteran’s groups, women’s groups and politicians of all stripes. The Press Democrat ran a banner on the front page reading, “Santa Rosa’s Future is at Stake.” It looked like a done deal. And then came December 4, 1945 – a day that will live in a kind of infamy. Office of Civil Defense – recondition buildings at Naval Air Station Sebastopol Rd. Great article! Can you provide any information about J Clarence Felciano AIA as he relates to Caulkins? I worked for Clarence in the ‘70s with C J (Jay) Harkness and we did a lot of schools with similar ‘Caulkin’ design elements. I believe Clarence started his firm in 1949. Felciano opened his own office in 1939, and had worked with Caulkins since 1936. According to the PD 4/30/1939, Felciano “aided in the designing of numerous junior college buildings. He also designed the field house built by the 20-30 Club at the Burbank Gardens.” The PD also ran a feature on him 10/21/1956 with a photo of the whole staff (alas, no one identified except for him). as it looks similar to many of his other designs . I’ve wondered that myself, but doubt it was his. There’s not enough fenestration , for starters, and the mismatched second floor windows are just odd. The incomplete courses in front are interesting but I’ve never seen him do anything like that. Directly across the street, however, is #1044, which was the Ling furniture store he designed in 1948. The original windows were 18 feet high, or about half again as tall as what is currently seen. Hi, great article! So nice to read about an Architect so prolific. We are the second owners of a home Caulkins designed for Ogden & Margaret Eisenhood that was finished in 1947 at 1521 Leonard Avenue in Santa Rosa. We have owned it since 2004. Follow up comment. Do you have any information regarding Karl J. Pettersen? He is the builder of our home. Thanks! Sorry, no info on Pettersen.